“How do I write a resume and cover letter that will grab the attention of a school administrator and get me an interview?” It’s a question that’s asked thousands of times by thousands of potential teachers every year. 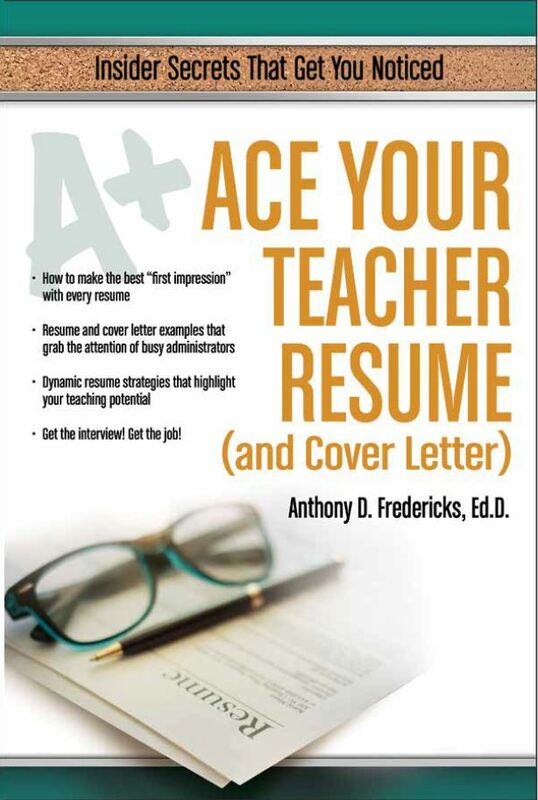 Ace Your Teacher Resume (and Cover Letter) is a captivating and highly practical book, which builds on the success of the critically acclaimed Ace Your Teacher Interview. 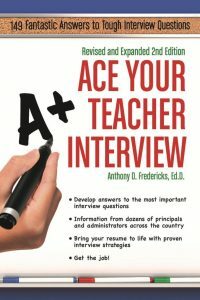 Award-winning author and teacher Anthony D. Fredericks, offers real-world guidelines, fresh advice, and down-to-earth tips from numerous principals and superintendents around the country. “How do I write a resume and cover letter that will grab the attention of a school administrator and get me an interview?” It’s a question that’s asked thousands of times by thousands of potential teachers every year. Ace Your Teacher Resume (and Cover Letter) is a captivating and highly practical book, which builds on the success of the critically acclaimed Ace Your Teacher Interview. Award-winning author and teacher Anthony D. Fredericks, offers real-world guidelines, fresh advice, and down-to-earth tips from numerous principals and superintendents around the country. Most important, he provides you with insider knowledge on what vocabulary, key words, and phrases school administrators look for. Discover what’s often missing from teacher resumes and what things to exclude from your resume. Ace Your Teacher Resume (& Cover Letter) gives you proven strategies, winning guidelines, and scores of sample resumes and cover letters. Also included are step-by-step writing instructions and that help you rise to the top of the applicant pool and give you a distinctive advantage over the competition—an advantage that can result in a permanent job offer and the career of your dreams. With this step-by-step guide, you can create a dynamic resume with a catching objective and an incredible cover letter rooted in your own unique experiences and philosophy. This book will show you how you can stand out as a teacher candidate truly at the top of your game! Anthony D. Fredericks, Ed.D. is a nationally recognized educator well known for his practical teacher materials and stimulating and engaging conference presentations. A professor of education at York College of Pennsylvania, he is an award-winning and best-selling author of more than 150 books, including teacher resource materials (Guided Reading in Grades 3-6), children’s books (Mountain Night, Mountain Day; The Tsunami Quilt), and adult non-fiction titles (The Secret Life of Clams). Ace Your Teacher Resume is the second in a series, it follows Ace Your Teachers Interview. His extensive background includes experience as a classroom teacher, reading specialist, professional storyteller, curriculum coordinator, educational consultant, and staff developer.